Please let it stop raining! Please let it stop raining! Why was I fretting about the weather on a recent Saturday? Well, allow me to explain. 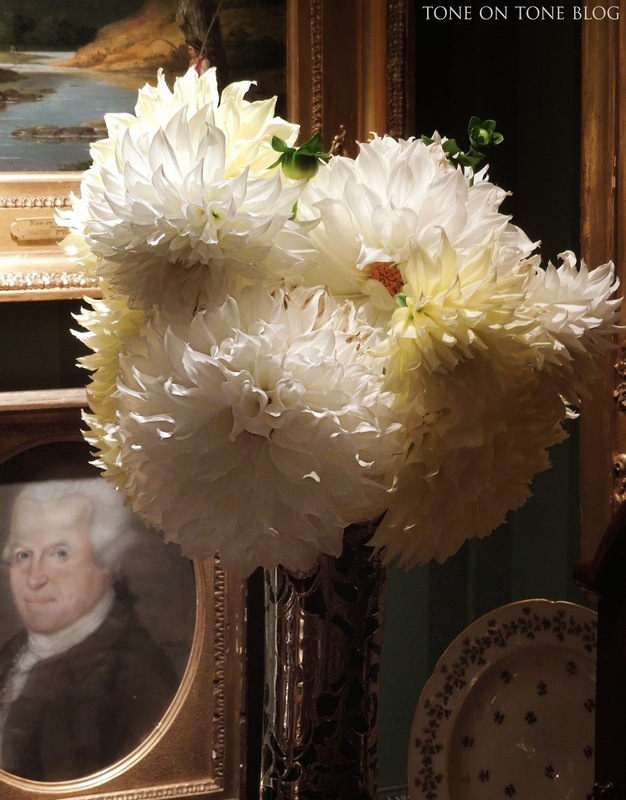 Tom and I had been invited to a garden party at the home of Stiles Colwill and Jonathan Gargiulo, renowned designers, shop owners, and fabulous tastemakers. 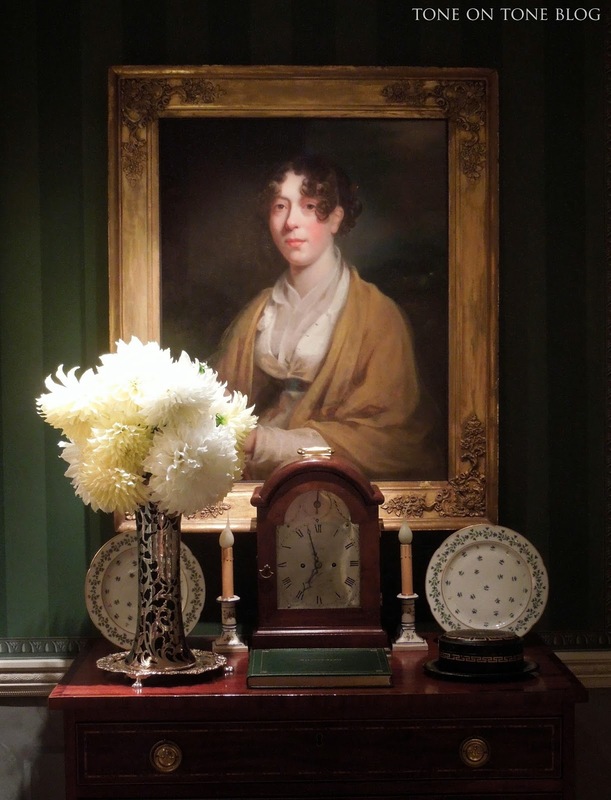 The party was to fete Meg Fairfax Fielding, our mutual friend and noted blog author of Pigtown Design. In case you are new to the blog world, Meg is a pioneer. 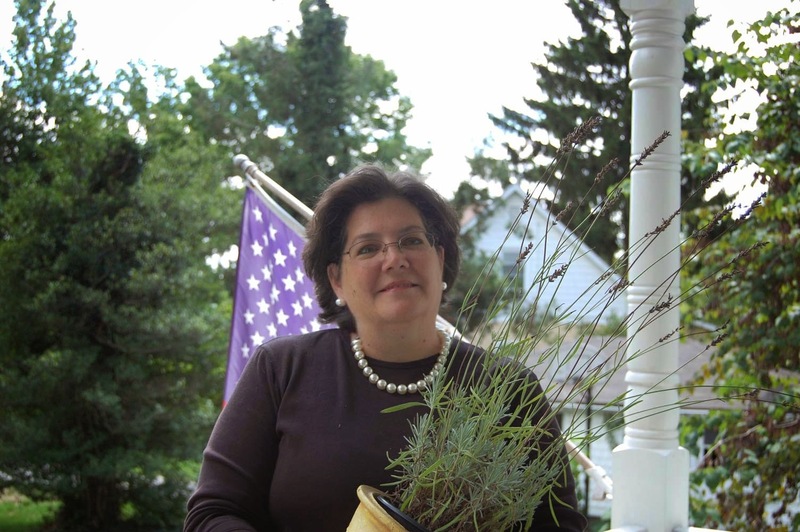 Since 2007, she has been writing about architecture, culture, design and popular events in Baltimore and elsewhere. 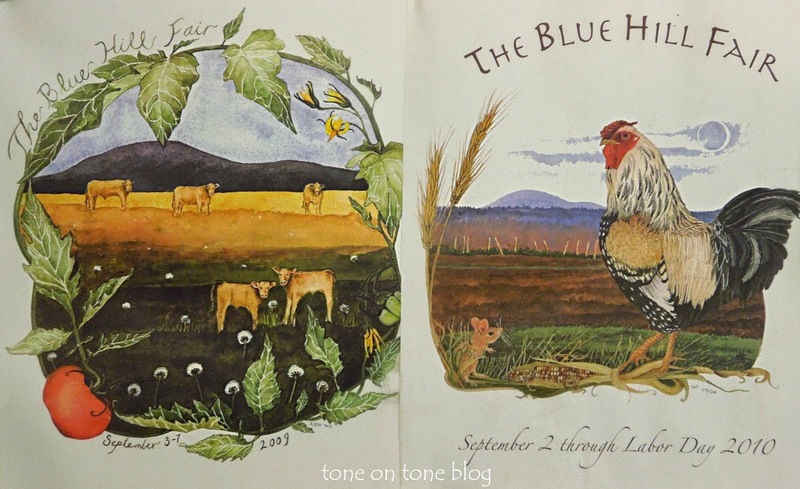 Pigtown Design was one of the very first blogs on the scene. Meg's point of view is highly respected. 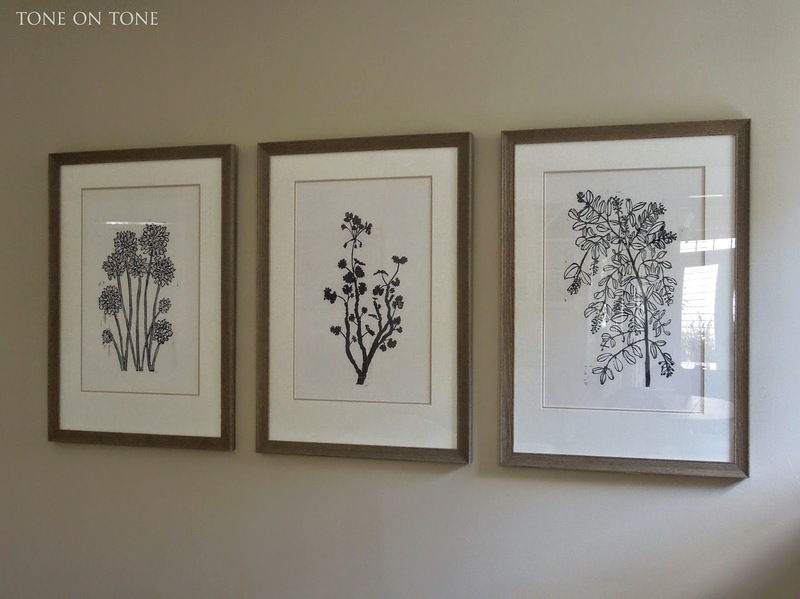 You might recognize her as a regular at Highpoint and / or as a guest on The Nate Berkus Show. 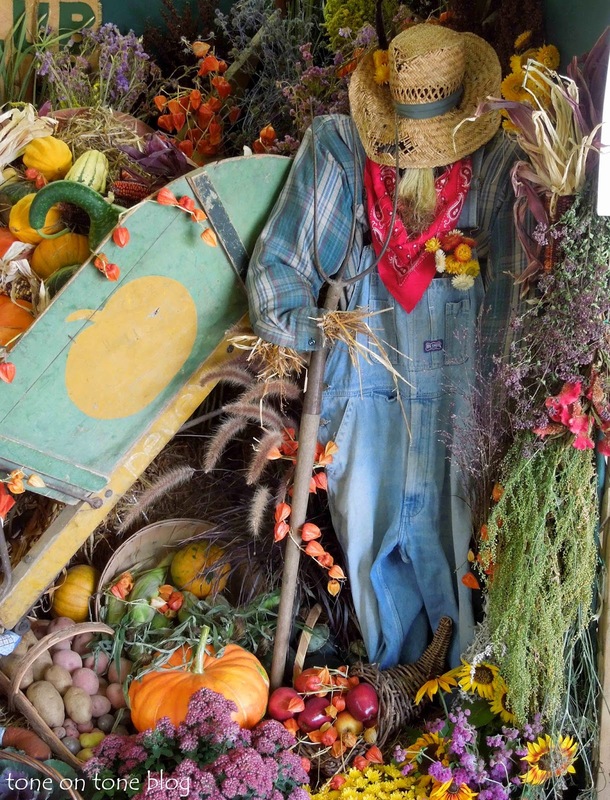 Meg had told me all about Jonathan and Stiles' magnificent gardens as well as their shop, Halcyon House Antiques, located just outside of Baltimore. (I am planning a shopping trip there so stay tuned for a future post.) 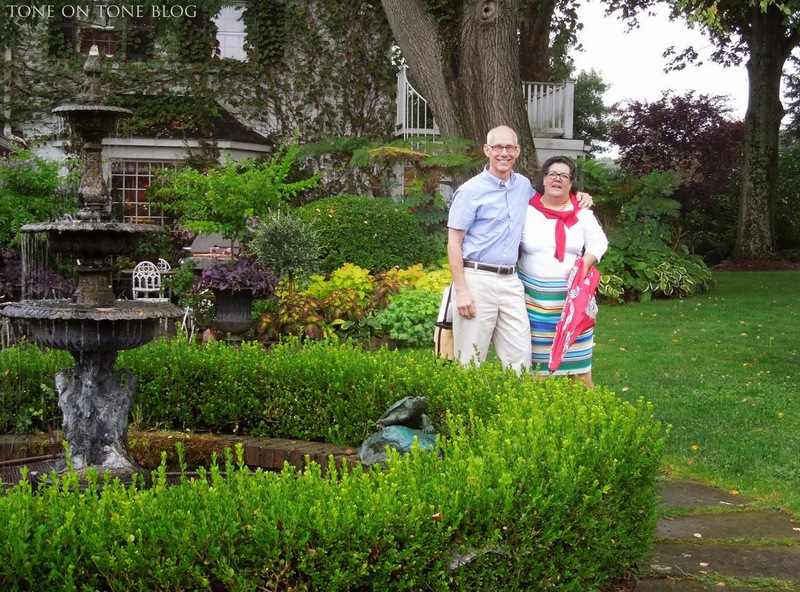 I was so eager to see their gardens that I begged Mother Nature for a bit of sunshine. 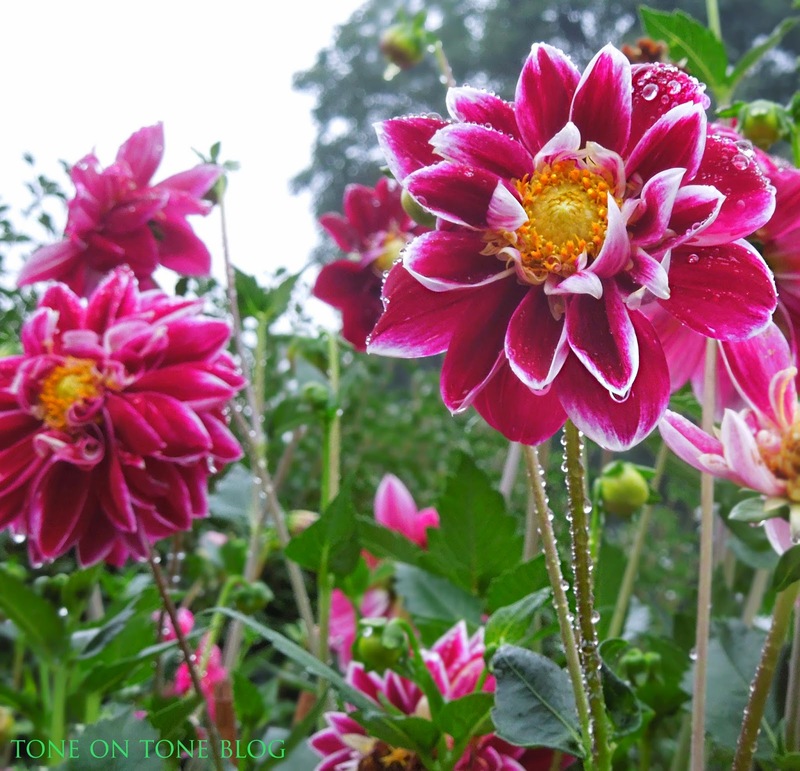 Though sunshine never came, the rain did stop. And, you know what? 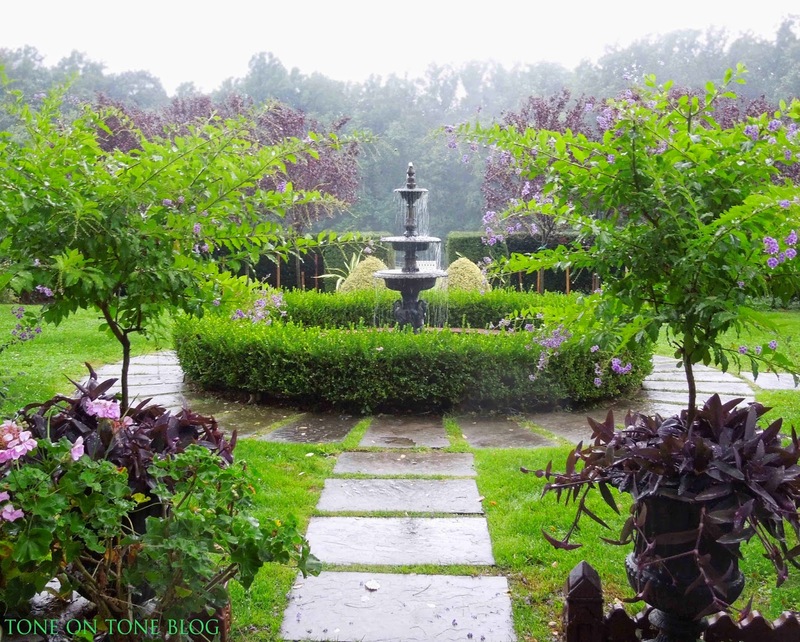 That evening was enchanting as the entire property was cloaked in a misty fog - very romantic and dewy. 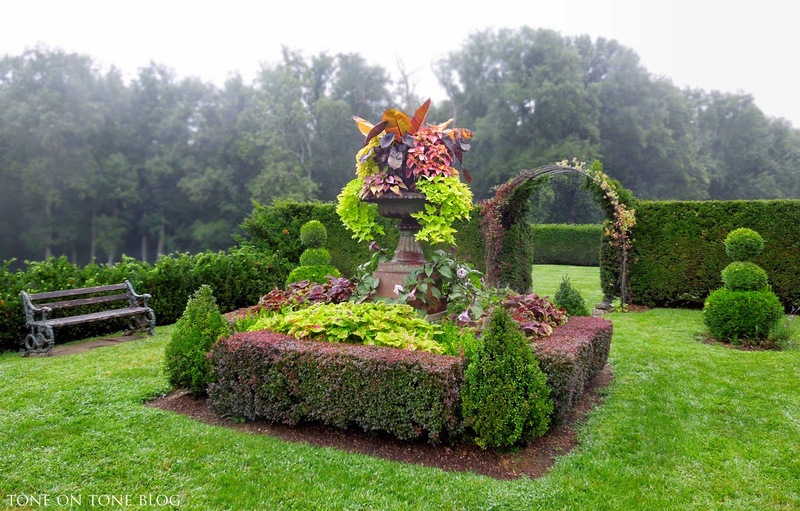 Welcome to Jonathan and Stiles' gorgeous gardens! 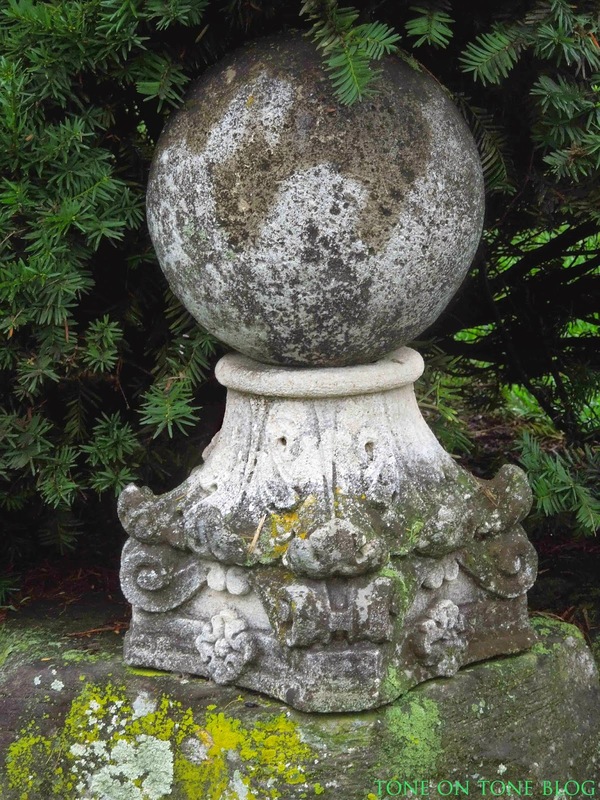 The gardens are divided into gracious "outdoor rooms," and thoughtfully appointed with urns, ornaments and furnishings. There is a sense of intimacy within the walls of tall hedges, as well as grand scale with the dramatic plantings and vast open fields beyond. 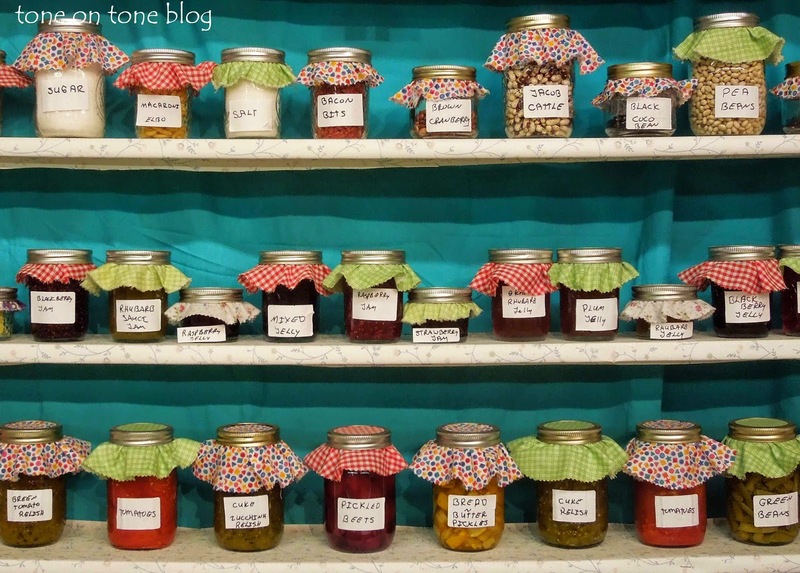 All the garden rooms are organized along strong axes. 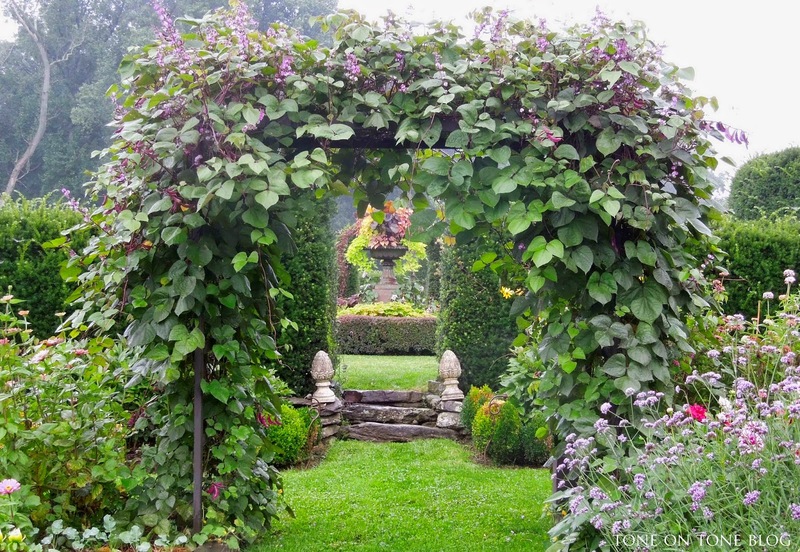 I love how the framed vistas - achieved via hedge openings and arbors - lead the viewer's eye from room to room. 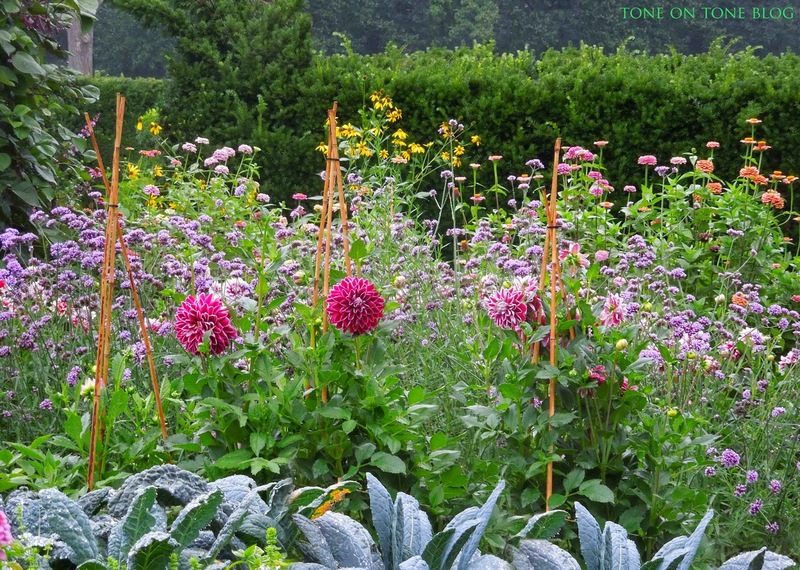 Stepping down to the potager and cutting garden, where vegetables are grown alongside flowers for arrangements throughout the house. 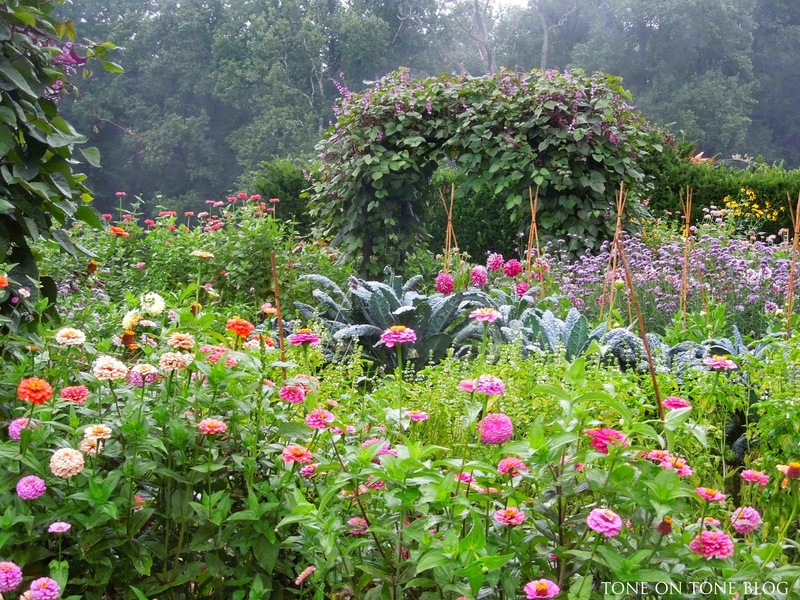 Ornamental kale, verbenas, zinnias and dahlias create a lush, layered look full of contrast, color and texture. 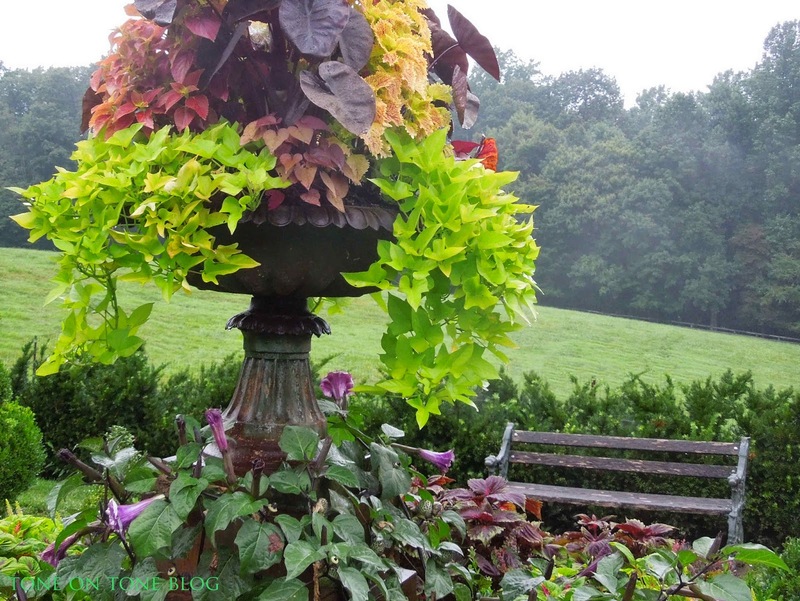 Seating is strategically placed to allow one to rest and admire the surrounding beauty. 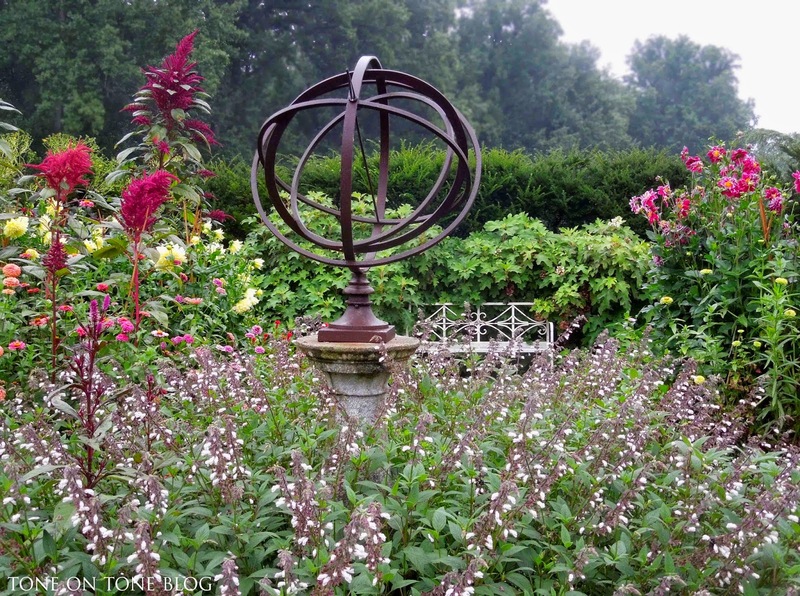 Both the armillary sphere and stone finial create focal points. 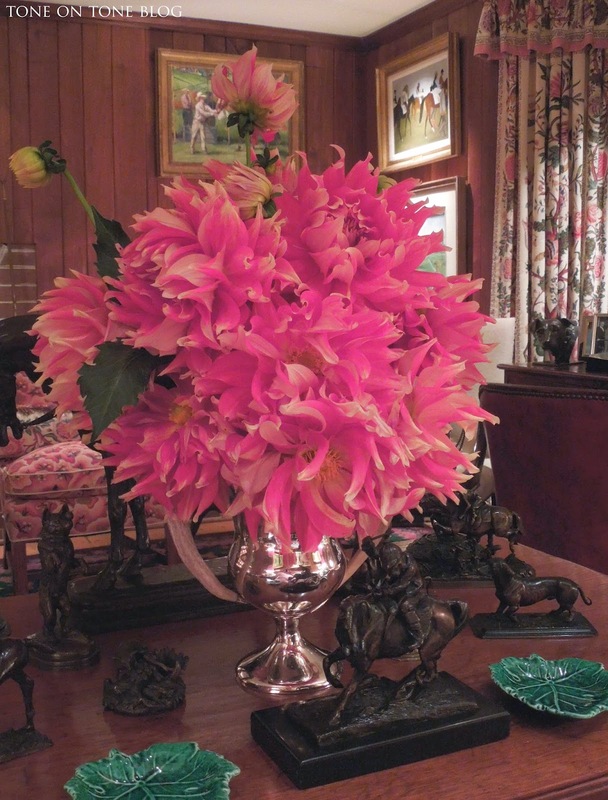 Spectacular dahlias from the cutting garden graced every room. 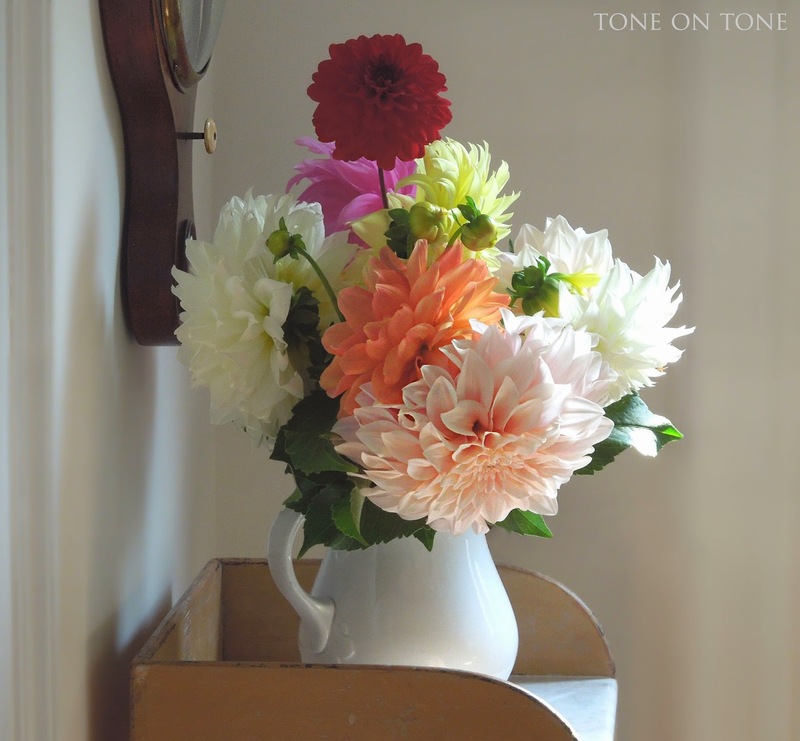 Notice the antique vessels chosen for the arrangements. Well, hello there ;-) Yes, I'm a lucky doggie...and a cutie! 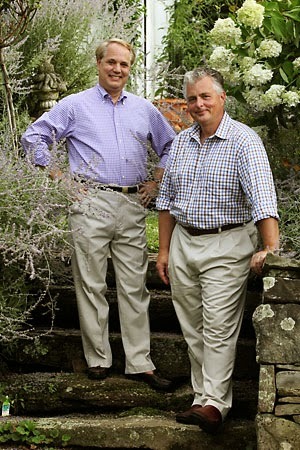 A very special thanks to Jonathan and Stiles for a most wonderful evening! 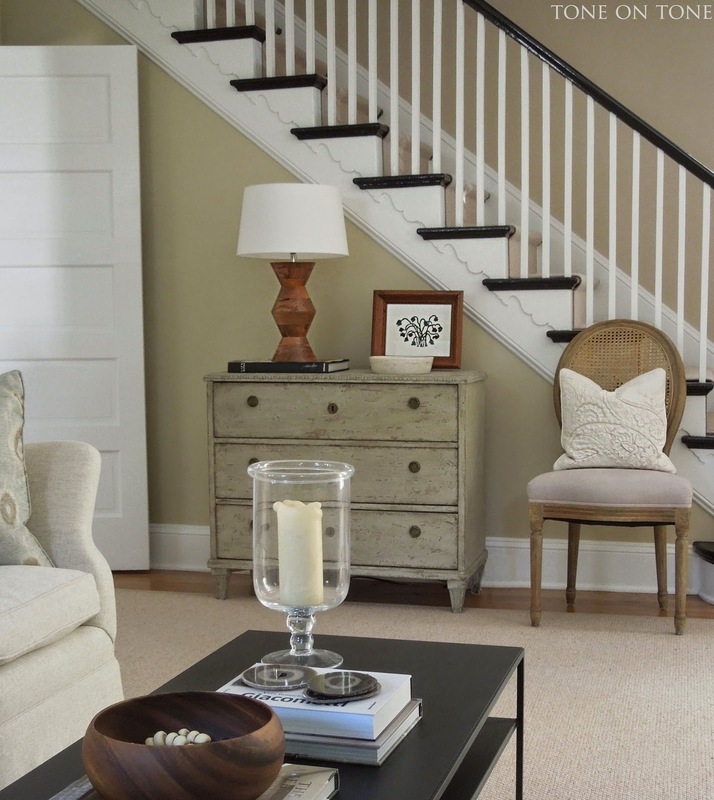 I'm delighted to share my client's living room in a historic 1918 cottage. Like all projects, this one is unique. 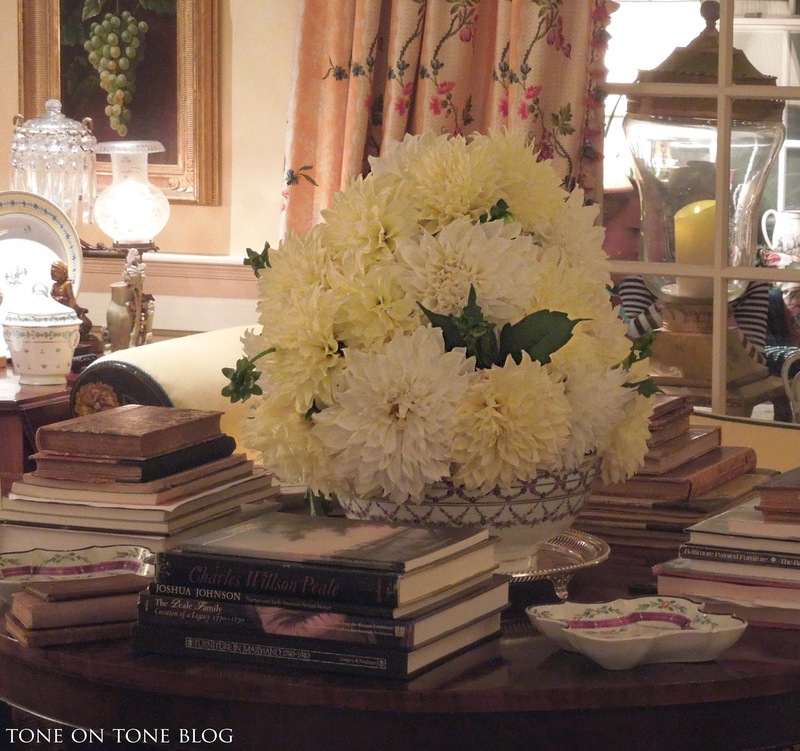 I think this room turned out beautifully, and it shows that antiques can be relevant, young and versatile. Earlier this year, Jen and Chris purchased a couple items from my shop. Then one thing led to another, and I started helping them with decorating. Sweet, right? First of all, they've been terrific - very patient plus open minded. Jen and Chris were ready to finish the living room fast, but it was important for me to understand how they live - for ex: formal entertaining vs chilling out, etc. Together we slowly worked on discovering their style, which is traditional to transitional. I wanted them to have a living room in which they felt comfortable entertaining their parents as well as friends their age. 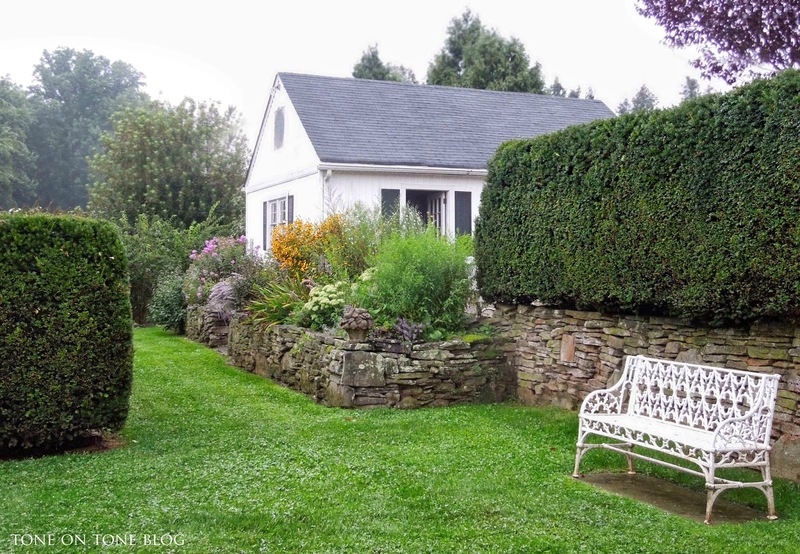 Because this is an older cottage, the room is not expansive. Also, it doesn't get a lot of natural light. 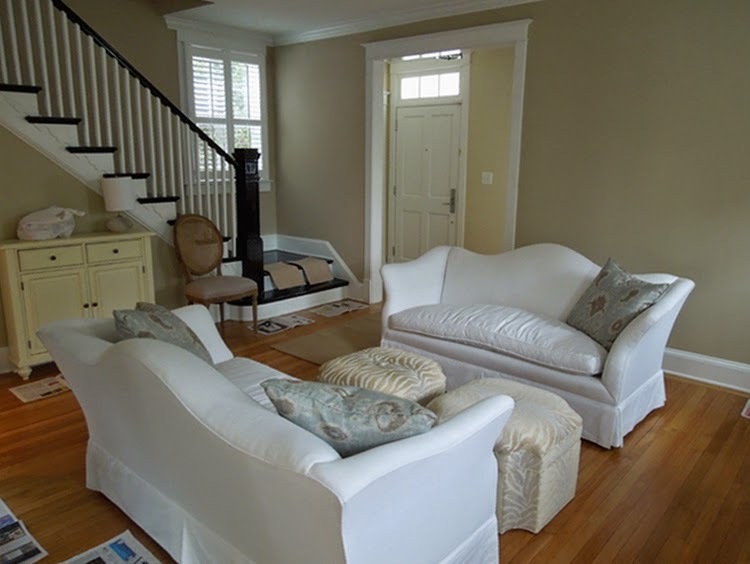 But, it does have a high ceiling, handsome staircase tucked to the side, charming millwork, and a casual vibe. Everything had already been painted, and they owned a pair of vintage camel-back sofas. I continued the neutral palette so the room could breathe. Tailored pieces were chosen for sophistication and timelessness. Antiques brought in character while accessories from West Elm, Crate and Barrel, Pottery Barn, and Room & Board added that "current" look. 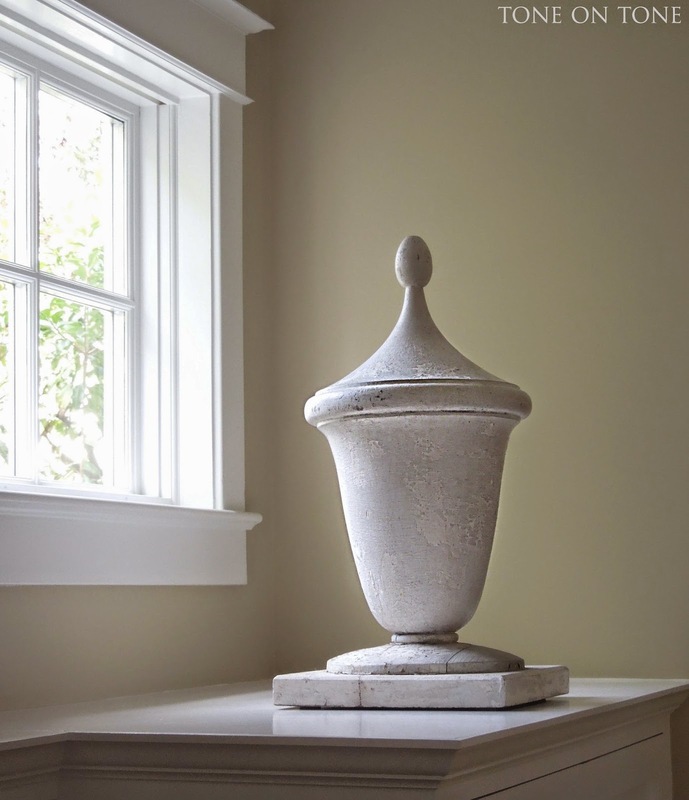 One of the first pieces I placed was this 1800s Swedish Gustavian chest from Tone on Tone. It provides needed storage and, being compact, doesn't get in the way. It's important to mix textures and finishes. I found this mid-century style lamp from Crate and Barrel and hoped Jen would approve. Not at first, but now she loves it :) Afterwards, I restyled the vignette using what she already owned: a print with vintage frame and marble bowl (handy for keys, etc). Here is an overview of the living room. The room needed light so I selected the Reed pendant fixture from Circa - notice the clean, tailored lines. 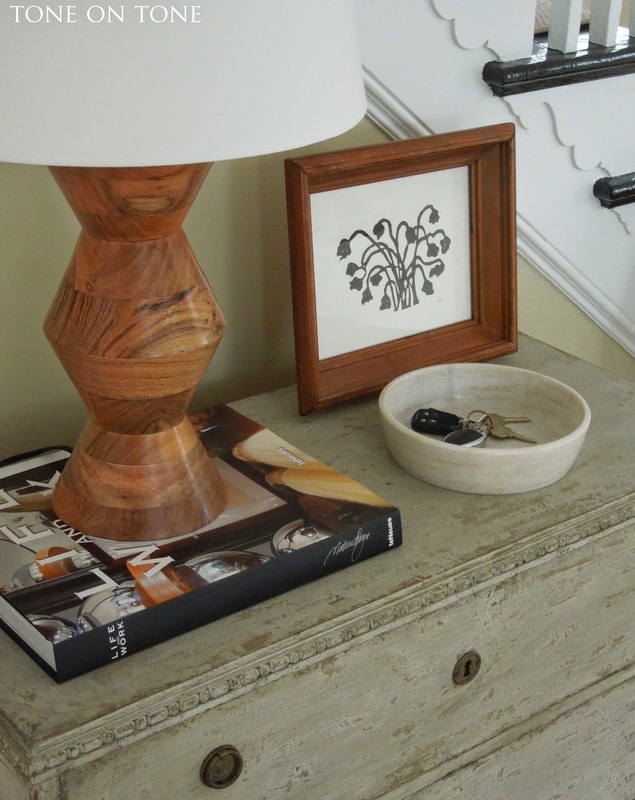 The metal coffee table is from Room & Board. It is narrow, and has a useful lower shelf. Plus it is reasonably priced. 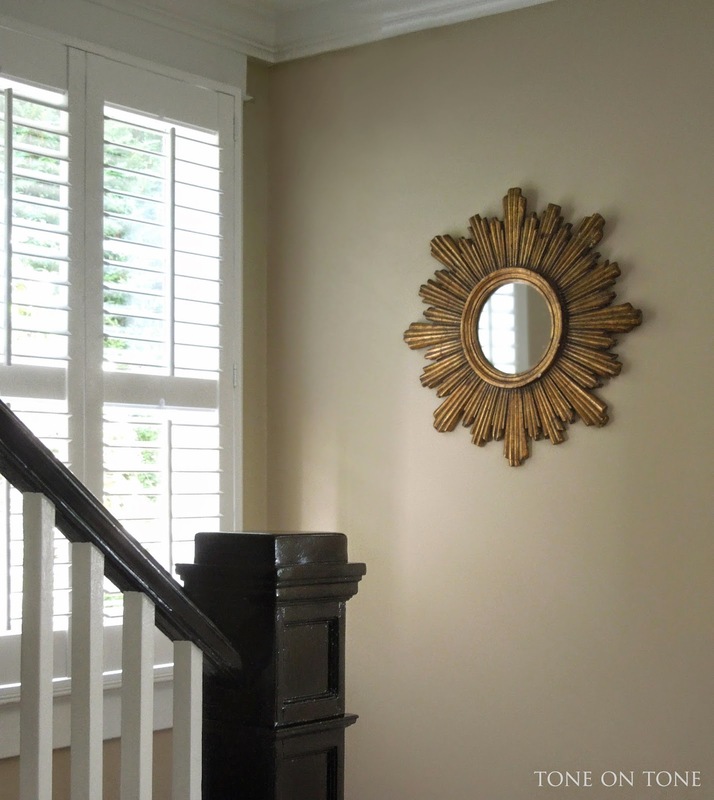 The antique paintings and vintage sunburst mirror are from my shop. 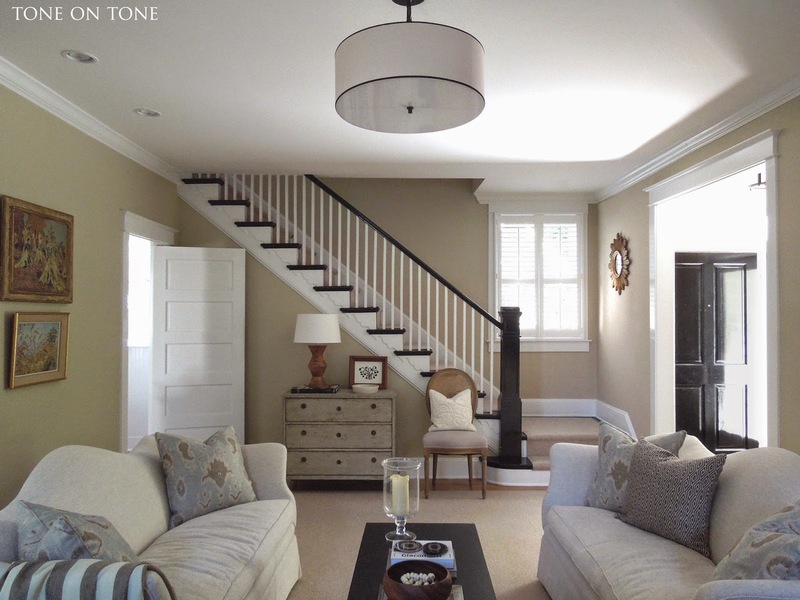 Walls are painted in Benjamin Moore Hush - AF 95. 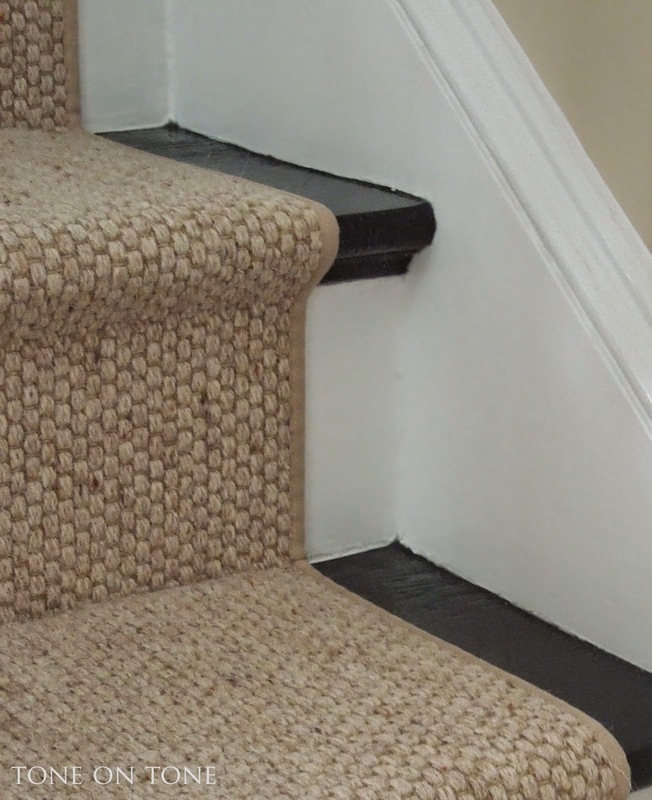 I chose a wool sisal style staircase runner with very narrow binding. 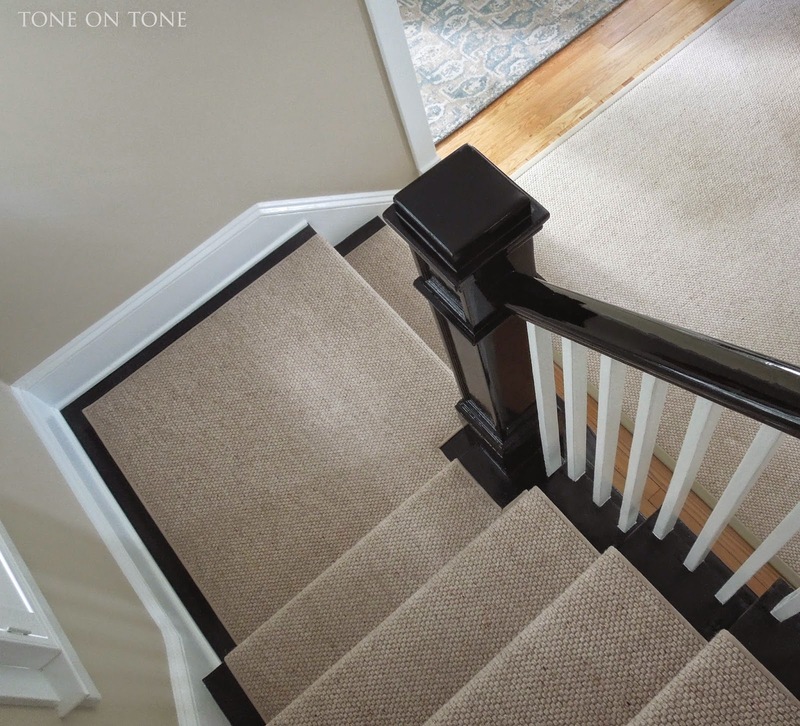 It's installed about 3 inches from the sides (and cut out around the newel post) in the Hollywood style, which is tailored and bespoke. The big area rug is the same, but with a different binding. 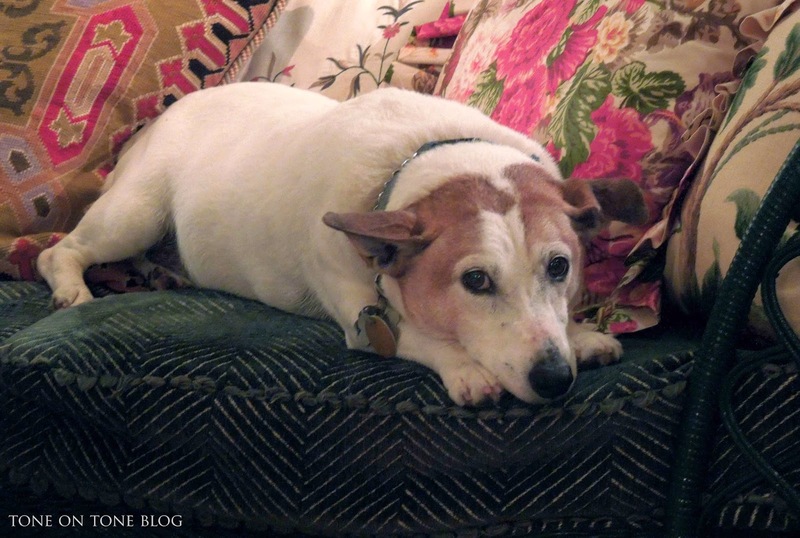 Larger area rugs do wonders for small spaces! 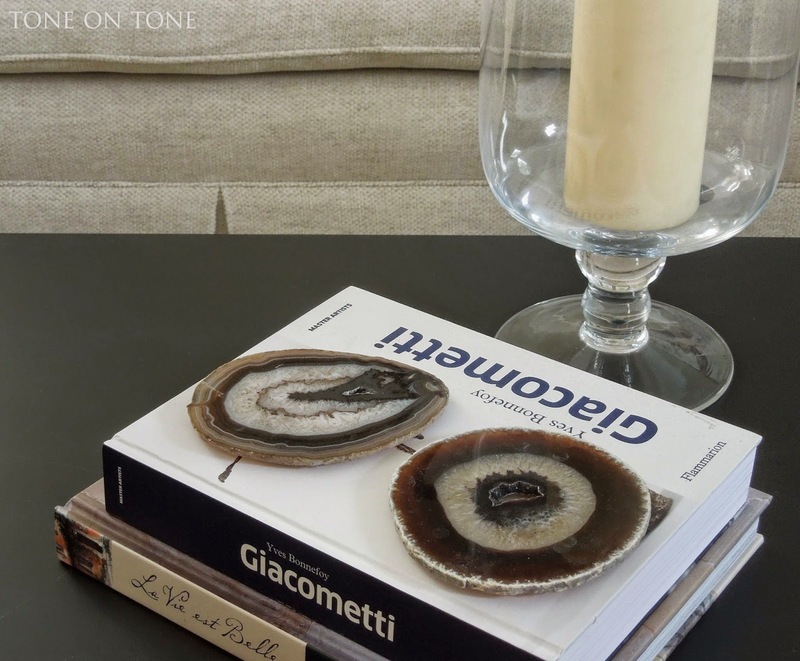 BELOW: Cool agate coasters from West Elm. 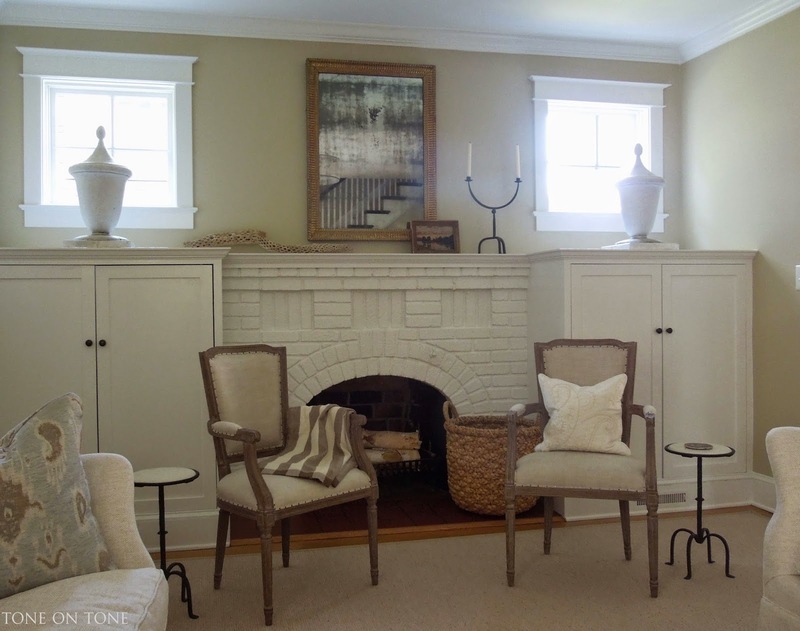 Anchoring the other side of the living room is a brick fireplace with an arched opening - very cottagey! The little drinks tables are from Pottery Barn. The antique giltwood mirror with heavily foxed mercury glass I found in France. The previous homeowner had the built-in cabinets installed. Over them is a pair of early 1800s carved wooden finials I brought back from Maine. The finials, with their crusty patina, make the cabinets look less new. Also, the cabinets now are more like pedestals. 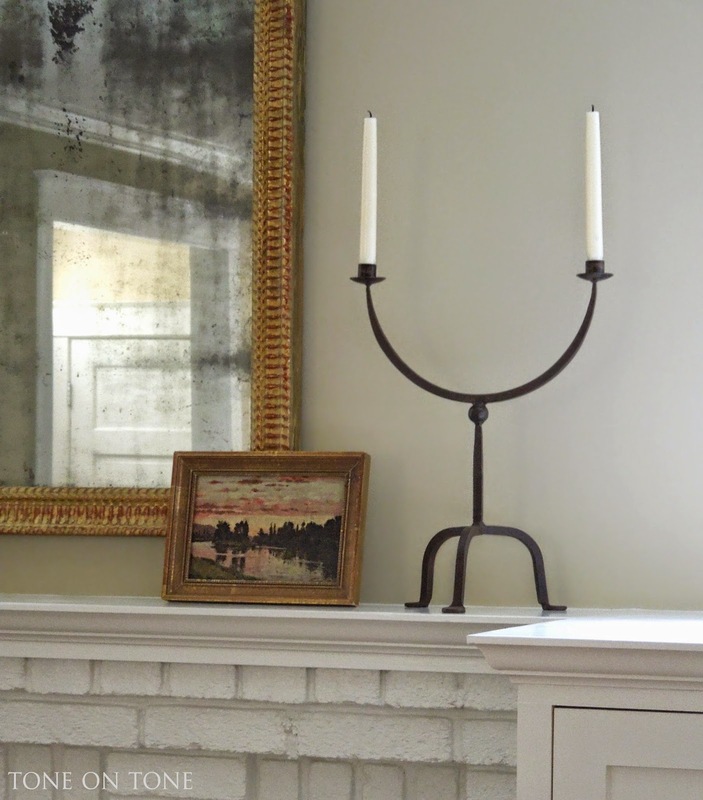 Old and new: Iron candelabra from Pottery Barn and 19th century painting from the Barbizon school, France. The scene in the painting reminds Jen and Chris of Upstate New York, where they vacation with family. 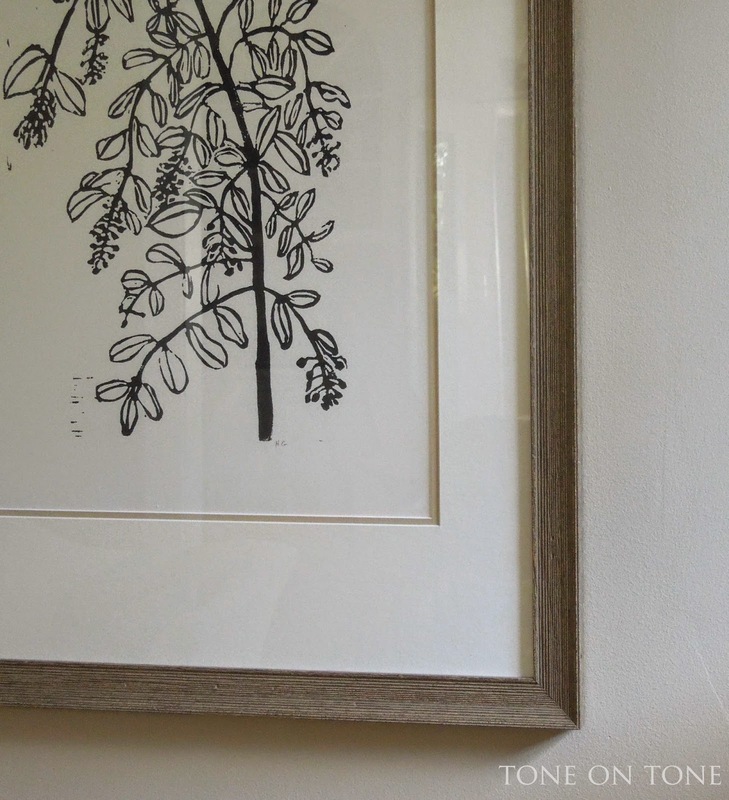 Botanical prints from Hugo Guinness - I selected frames resembling driftwood for an organic look. Hope you have enjoyed seeing this project. Huge thanks to my awesome clients, Jen and Chris!!! 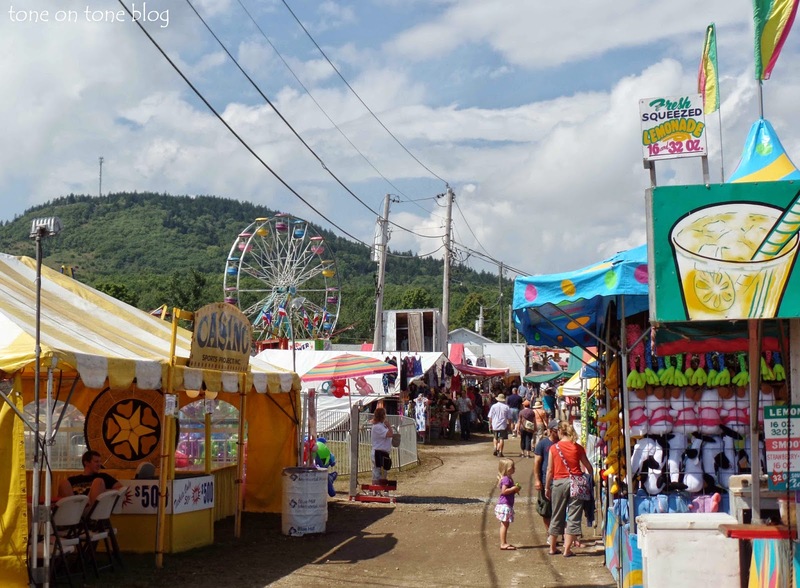 For over 100 years, Mainers and "people from away" (as the locals say) have all joined in the fun and festivities at the Blue Hill Fair held each Labor Day weekend. 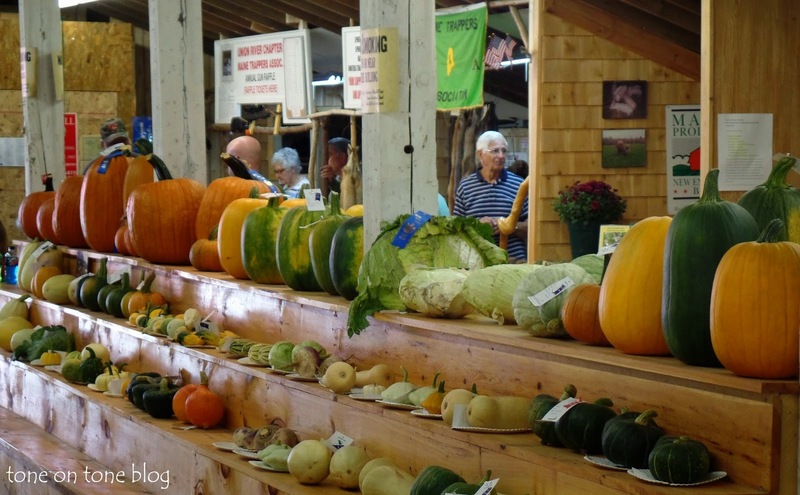 Tom and I went for the first time, and what did we find at this "Downeast" country fair? 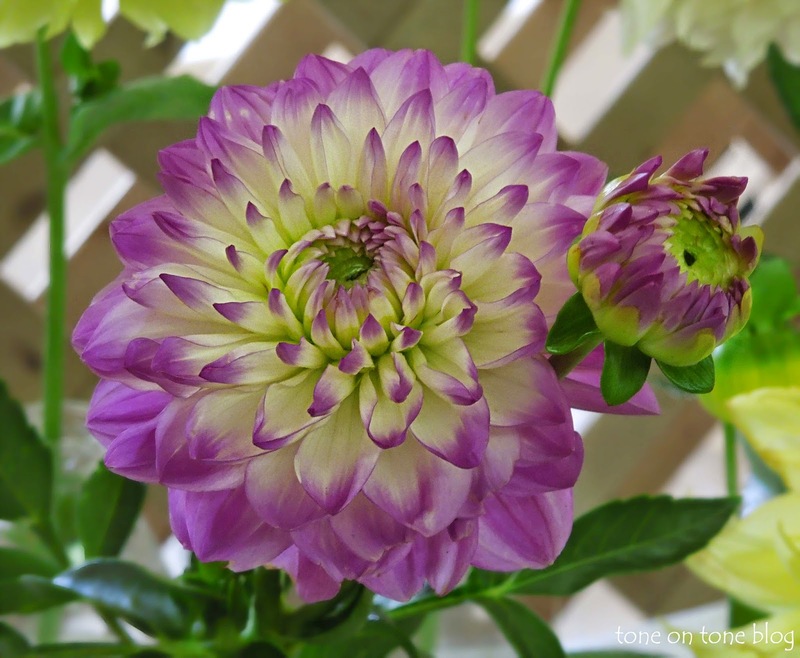 An explosion for the senses! 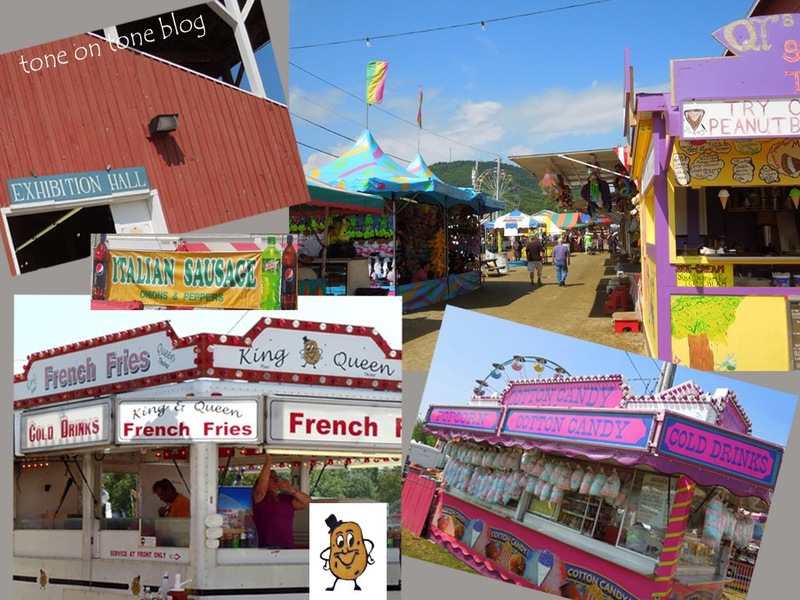 First, the food: Italian sausages with grilled onions, crispy French fries, hot doughnuts, blueberry and apple pies...all very tempting and lip-smacking good! 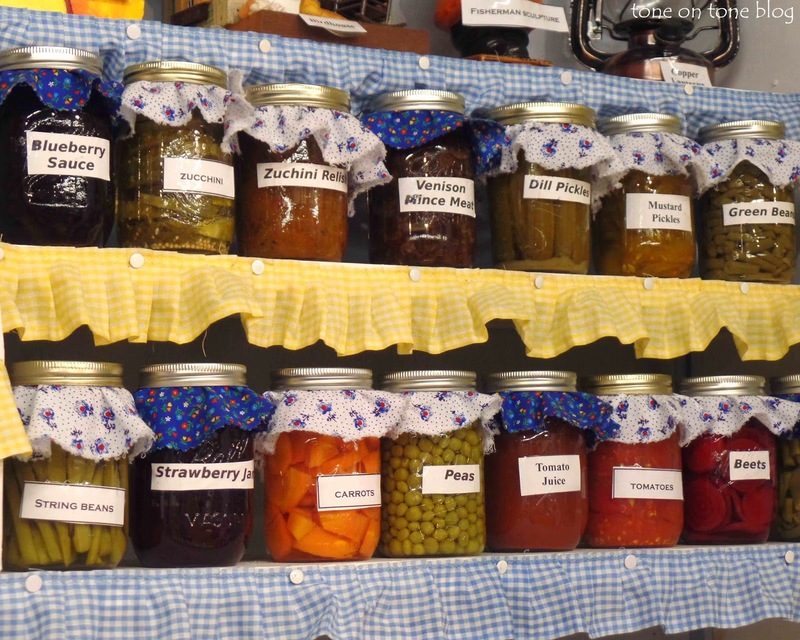 (Yes, we sampled every one of those.) There was music, entertainment, games and rides, of course - even a petting zoo for the kids (and a few grownups, we spied). Additionally, the fair had livestock shows full of champions from pigs to cows. 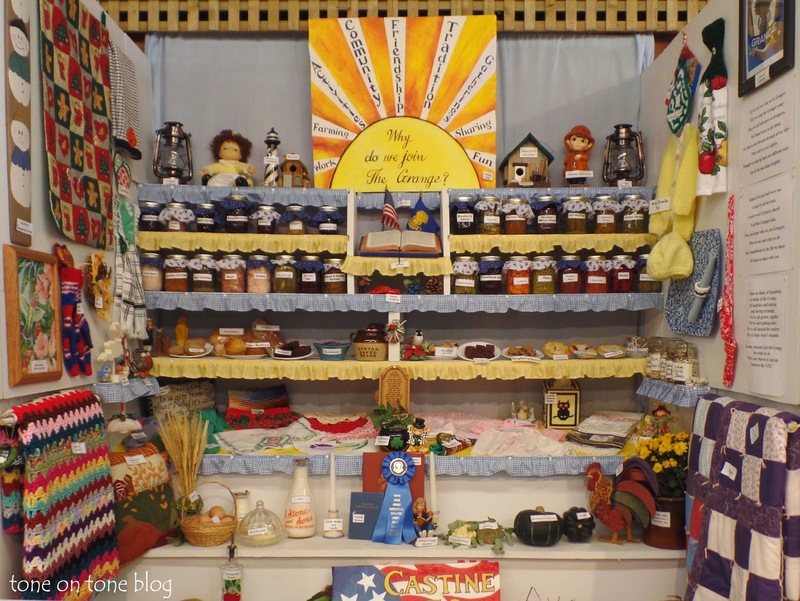 But, our favorite was checking out the exhibition halls filled with colorful displays of crafts, vegetables as well as flowers in every happy hue of the rainbow. 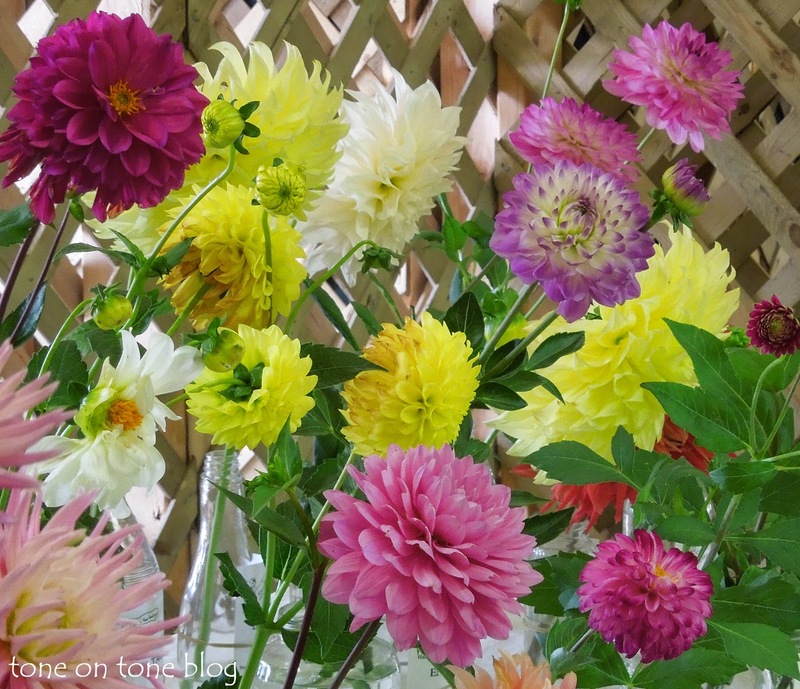 Speaking of happy colors, we were greeted with the MOST perfect dahlias from our friend Marty's garden. 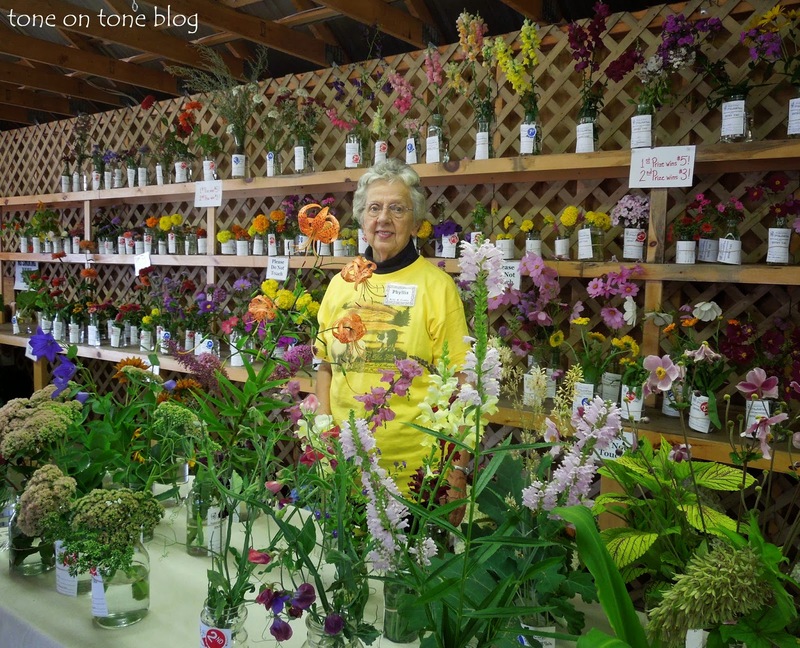 She is a master gardener and member of the Castine Garden Club. Many thanks, Marty! 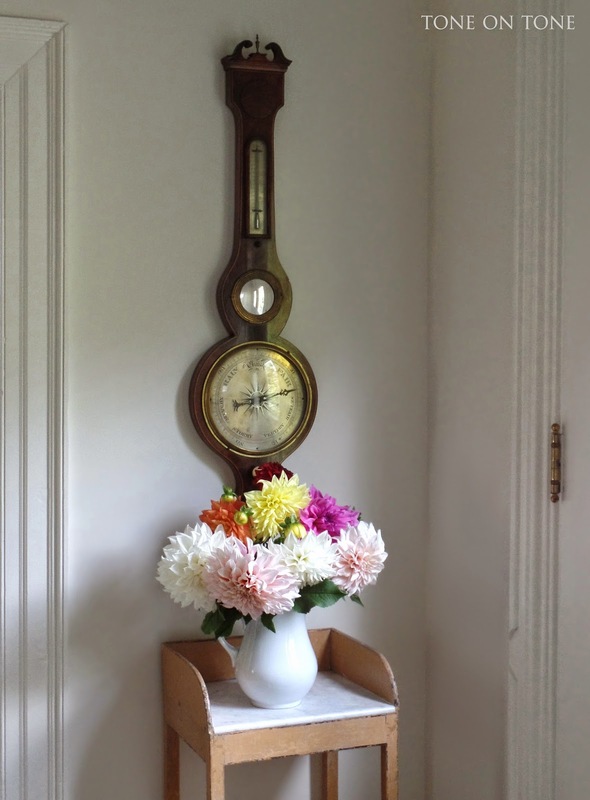 The exquisite barometer, which Tom and I love very much, was a gift from good friends. Thank you, Gail and Saul! 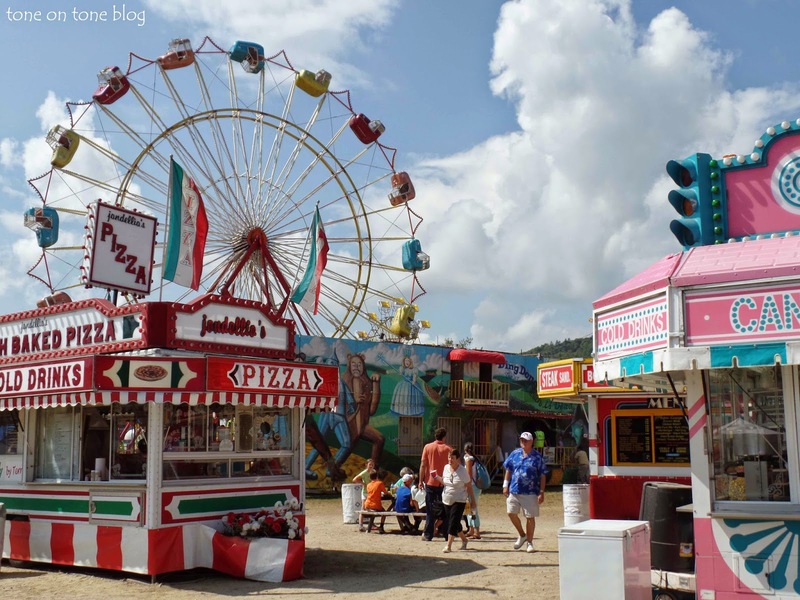 Now let's check out the fair. 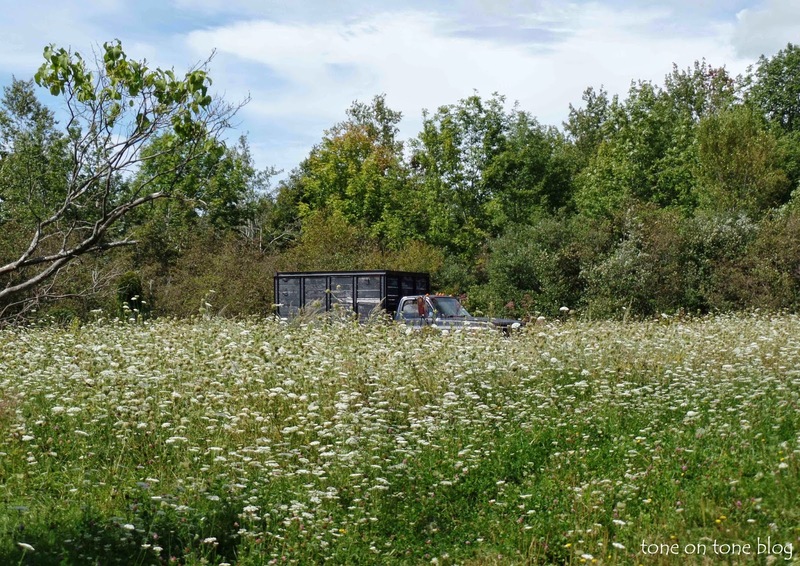 On the drive over, I had to snap this vintage truck lost in a field of Queen Anne's Lace flowers. 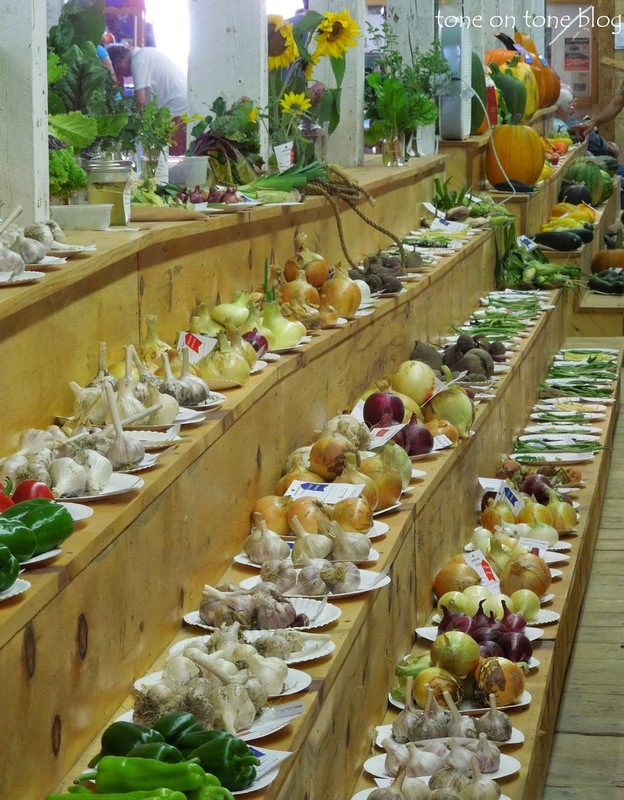 This annual fair is held during Labor Day weekend in Blue Hill, Maine. 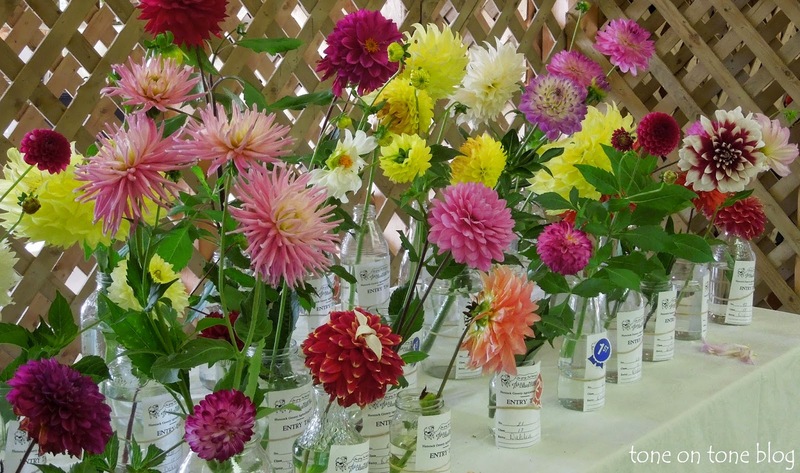 Beautiful dahlias vying for a prize in one of the exhibition halls. 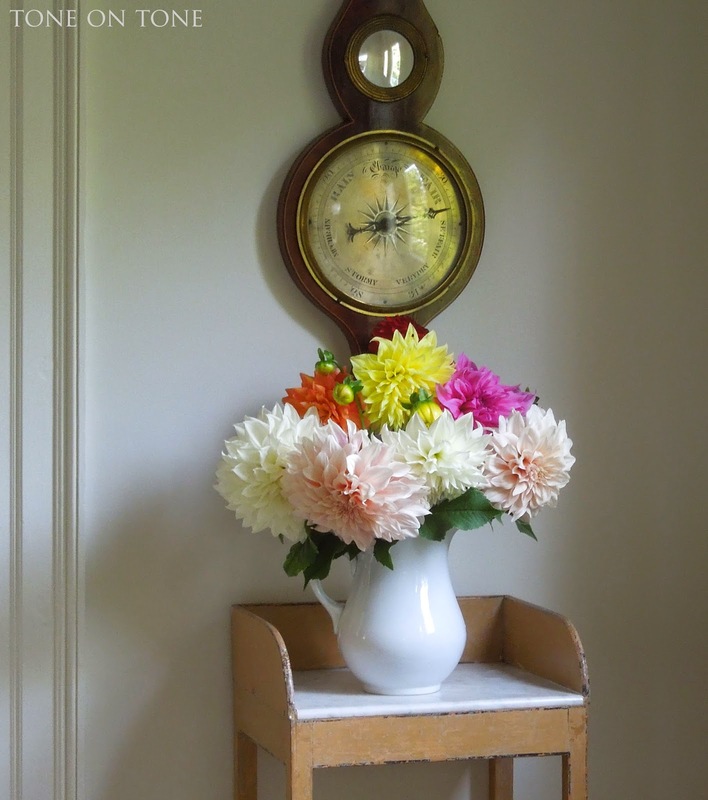 It was a pleasant surprise to find these dahlias still looking so fresh after four days. Labor Day weekend was quite warm, and we visited on the last day. 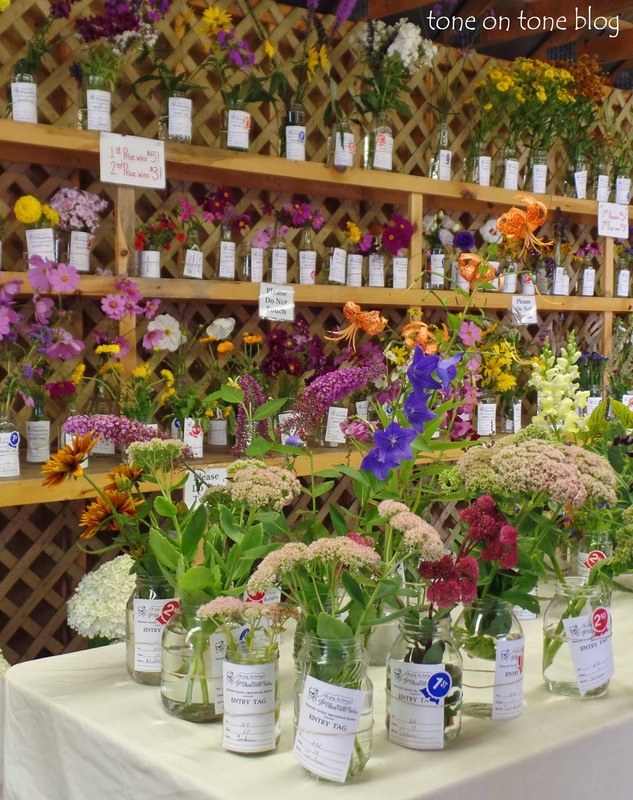 More flower entries - the competition was fierce! 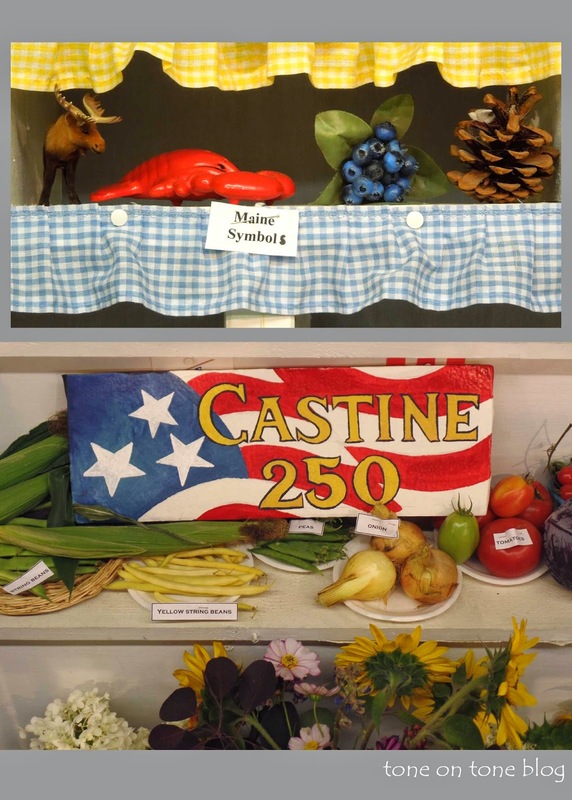 I was fascinated by these very creative and informative Grange agricultural displays - especially this one from Castine Grange #250. 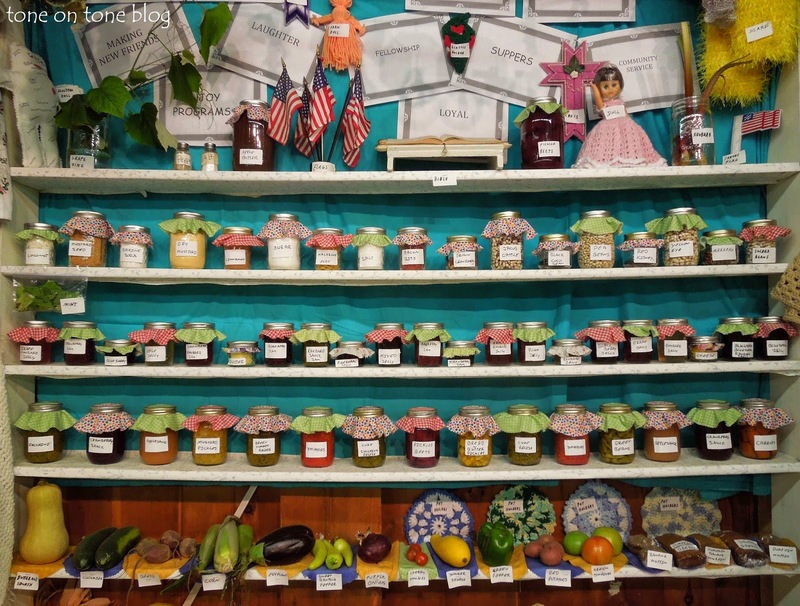 ABOVE: The moose, lobster, blueberry and pinecone are all synonymous with Maine. BELOW: Note the homespun cottons printed in charming patterns. 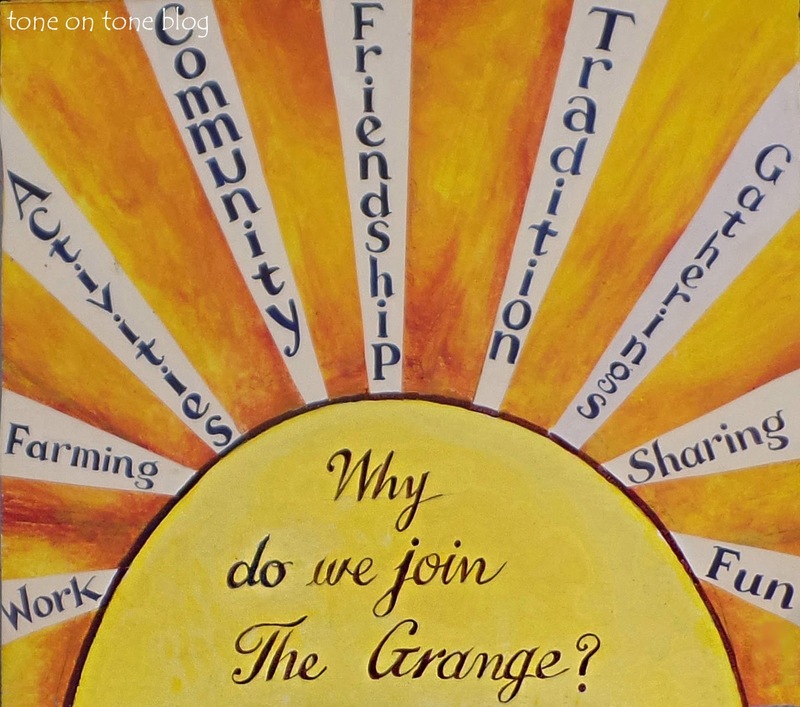 Another one by a different community Grange organization. BELOW: Hi, there! 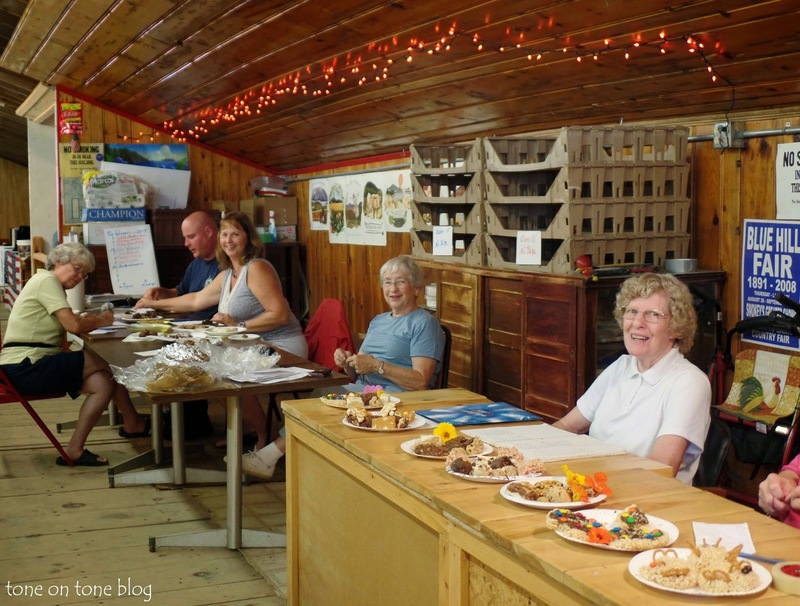 A peek of the judges at work. Introducing Miss Capela, a grand champion! 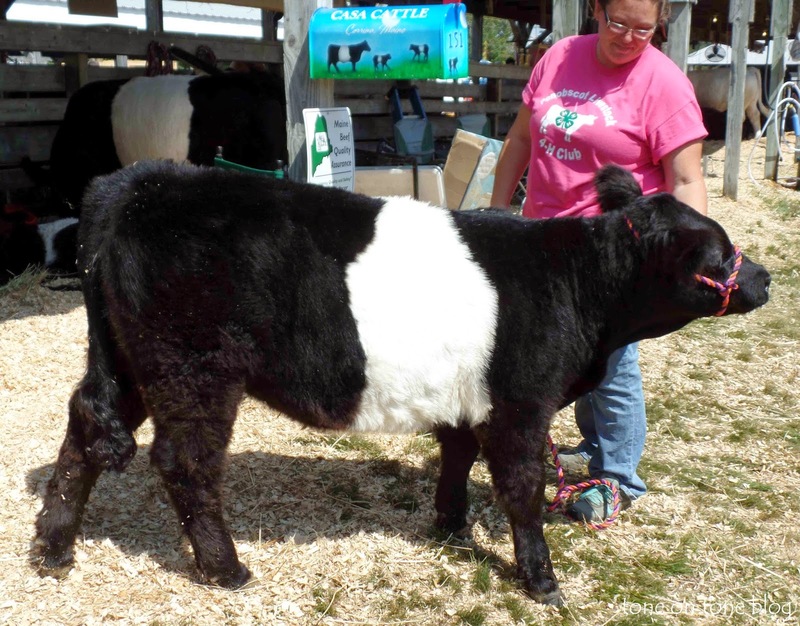 She is a Belted Galloway (AKA Oreo cow) from Casa Cattle Company, Corinna, Maine. Congratulations to Capela!! 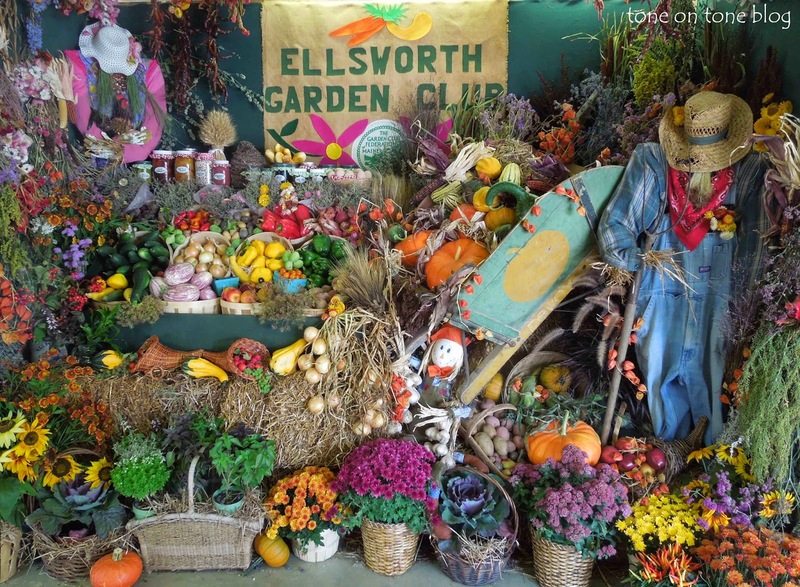 And I leave you with this fabulous autumnal display by the folks at the Ellsworth Garden Club.